“Updated” is an understatement. The latest Nike Vomero 14 turns previous models on its head. WHAT’S UP WITH THE NIKE AIR ZOOM VOMERO 14? Have you heard the rumors? The new Nike Air Zoom Vomero 14 is finally here and fully lives up to its expectations in terms of next-level performance and head-turning design. It’s the perfect pair for neutral runners with average arches who are looking for a premium, plush ride—without skimping on explosive energy return. WHAT DOES THE NIKE AIR ZOOM VOMERO 14 REPLACE? Nike is the leading name in the shoe game and the latest Vomero 14 proves why. If you loved the Nike Air Zoom Vomero 13 released last December of 2017, it’s hard to believe that this year’s iteration can get even better (spoiler alert: it did). WHAT’S NEW IN THE NIKE AIR ZOOM VOMERO 14? Those who have followed the history of the Nike Vomero know that the Vomero 14 has some big shoes to fill. How can you top the bells and whistles of the Cushlon, Dynamic Fit, and Flywire technology boasted by its predecessors? Answer: With even more cushy bounciness wrapped up into a sleeker package. Take a side-by-side look at the new Nike Vomero 14 vs. the 13 and the stunning differences are obvious. The external heel tab is now more pronounced, hanging out further and rolling up higher on the rearfoot for transitioning that rocks as easily as it looks. You’ll also note the heel collar tab is a bit higher on the Vomero 14, designed to slide on effortlessly like a sock… because let’s face it, running is that much easier when our shoes aren’t a struggle to get on. The foam pods lining the collar also hug the back of your foot for a secure feel. Moving to the midfoot, check out the redesigned Flywire lace system; whereas the older Vomeros had traditional eyelets dispersed over the shoe’s tongue, your laces are now looped through a lower cabling system. Why? Too many runners struggle with hot spots and pressure points at the tops of their feet—especially those with high arches and instep volumes. The updated Dynamic Fit and Flywire lacing system on the Air Zoom Vomero 14 takes pressure off the tops of your feet by pulling it down to the medial and lateral sides of your foot instead. This not only lets you log plenty of high-mileage runs without feeling tightness or irritation, but the unique technology also helps you dial in the perfectly snug fit catered to your unique foot shape—so you can say goodbye to in-shoe wiggle and frustrating heel slippage once and for all. Before flipping over the Nike Air Zoom Vomero 14 to scope the outsole, don’t forget to appreciate the newly redesigned mesh that seamlessly wraps around the upper. It essentially redesigns the meaning of lightweight breathability, so you can leave the socks at home if you want to. Trust us—it’s so soft, that going sock-less isn’t totally out of the realm of possibilities. On the bottom, you’ll see that the new outsole on the Vomero 14 has been completely redone to the nines. Whereas lateral grooves were once placed along the shoe’s forefoot, one deep medial groove now runs vertically from toe to heel, letting you worry less about balance and more about picking up the pace on your tempo runs. Multi-directional lugs scatter the surface with strategic positioning for high-impact areas, so your Vomero 14’s are ready to withstand tons of wear and tear, refusing to quit until you do. Even better, the pressure-mapped outsole takes advantage of Nikes’ dual-density rubber, serving up optimized cushioning with each and every step. If you’re wondering what’s new about the Nike Air Zoom Vomero 14 and aren’t sure whether the latest model is worth the upgrade, the short answer is: yes! WHO ARE THE NIKE AIR ZOOM VOMERO 14 FOR? This shoe boasts Level 5 cushioning, so you can count on an ultra-plush underfoot sensation on all your road runs. It performs best on the pavement when worn by neutral pronators; if you suffer from overpronation, you might look for a shoe that can offer a bit more stability control. The beauty of the Vomero 14 is that it combines some of Nike’s softest Lunar cushioning with the zippy Air Zoom technology. Lunar foam is literally inspired by the way astronauts bounce on the moon, so if you’ve ever wanted to defy gravity, now might be your chance. This core material disperses impact evenly across the foot when combined with the surrounding, more durable Cushlon foam, which offers a larger distribution area for shock absorption and protects against breakdown. To all the long-distance runners out there, this means that the most vulnerable areas of your feet will stay protected during repetitive impact, so you can pound some serious pavement while feeling less fatigued. Plus, the Lunar foam in the Nike Vomero 14 shoes is 30% lighter than standard Phylon material, meaning you don’t need to tack on extra weight for super-soft, springy comfort. Okay, so now take that bouncy, walking-on-the-moon sensation and pair it up with Nike’s signature Air Zoom technology in the Vomero 14. Crafted with elite performance in mind, this cushioning system utilizes tiny pockets of pressurized air. Tightly stretched fibers wrapped around the air pockets compress upon landing to absorb the impact of shock, then snap back into shape when pressure is released, creating a springy push-off effect designed to maximize speed and agility. 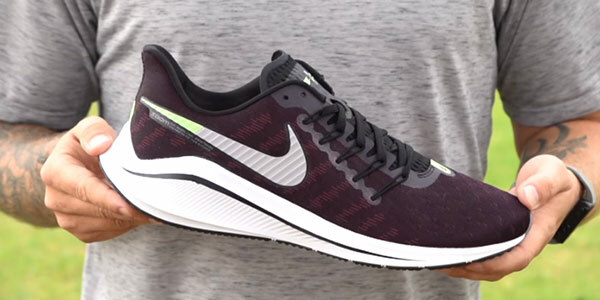 Not only is the Nike Air Zoom Vomero 14 a standout choice for runners who need long-distance comfort, but it’s also an excellent choice for athletes looking to pick up the tempo and improve their PRs. We’re calling that a win-win. If the image of bouncing right into outer space with rocket-like speed doesn’t cut it for you, how about the Dynamic Fit system, which connects directly to Flywire cables and shoelaces for a custom-like fit? The newly relocated cables allow for retargeted support, enhanced flexibility, and less distraction at the forefoot so you can run more comfortably, whether it’s on a 5K, marathon, or sprints around the track. Comfort is taken up another notch by the amply-padded collar—now with a tab for easy removal—that’ll keep your ankle snugly locked in for even the longest of hauls. Oh, and let’s not forget about the sleek, stylish design that Nike is known for. The latest Vomero 14 is sure to command some serious attention. Whether you’re an elite athlete, casual runner, or dedicated sneakerhead, we know the nitty gritty is important. Here are all the specs on the latest Nike Air Zoom Vomero 14. These guys rank as a Level 5 cushion shoe, meaning you’ll be hard-pressed to find a sneaker with a softer underfoot carriage. Plush to the max here. When we talk about “drop”, we refer to the height offset between the rearfoot and forefoot. 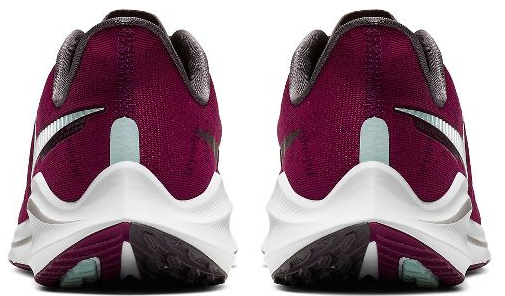 The Nike Vomero 14 has a 10mm drop, which is pretty standard across running shoes for neutral pronators. When it comes to foot fashion, Nike is at the forefoot of design. The latest Vomero 14 comes available in three different colorways so you can show off your unique sense of style. Want to know for sure if the Nike Air Zoom Vomero 14 is right for you? Take 2-3 minutes to run through our online SHOE FIT FINDER. You can also call 800.551.5558 or drop by your hometown store and we’ll guide you through your personal fitting. See more of our favorites on Pinterest!